Are you worried about the quality of your new home? Get Peace of Mind from a Snagging Inspection. 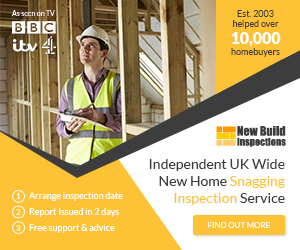 Has the builder of your new home told you a snagging inspection is a waste of money? Get a Full Refund If Your Home Has fewer than Ten Defects. Your Snagging Inspection Will be the Best Value You Can Find. Undertaken by the Country’s Leading Professional Snaggers. UK Prices Start at Just £299, Inclusive of VAT. Your Snagging Inspector is Experienced and Fully Insured. Your Snagging List is Issued within 48hrs of the Inspection with a Summary on the Day by Phone or Email. No Conflict of Interest. We are Completely Independent. Fewer than 10 Defects and we will Give You a Full Refund. Our Recommended Service is Provided by New Build Inspections Ltd. Complete the form below to get immediate access to our pricing information and our online booking form.